I am so excited to share some Classroom Valentine goodies with you today! First up were treat bags for La La’s preschool classmates. 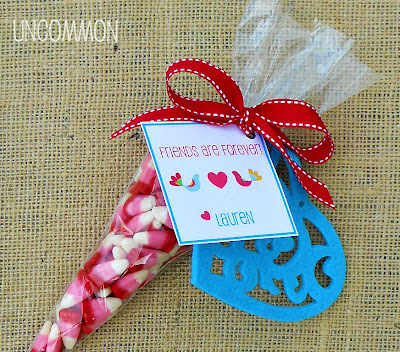 I filled the cone shaped treat bags with Valentine candy corn and tied them with her sweet little note and a felt heart! I used my favorite Valentine color combo of red, pink, and turquoise for these little goodie bags! She was so excited, but looked at me like I was crazy when I told her we couldn’t bring them to school for another month! Well, maybe I am crazy! But what is a blogger to do? The felt heart goodness continues on to a bright and cheery Valentine heart garland! This was one of those incredibly easy projects that was done while I was catching up on my blogs! All you have to do is cut your string to the desired length and thread your hearts on! Easy peasy, but oh so cute! I hope that you guys have a great weekend! So super cute! I have got to head to Target to see if I can find some! Very creative! 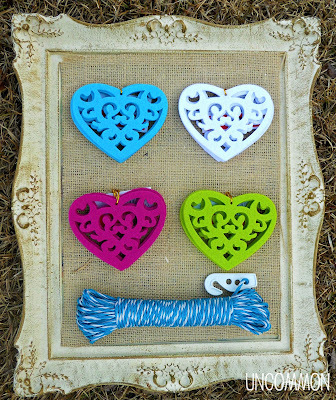 Great buy and cute ideas! Score! Very cute!! Love those hearts! Love this! 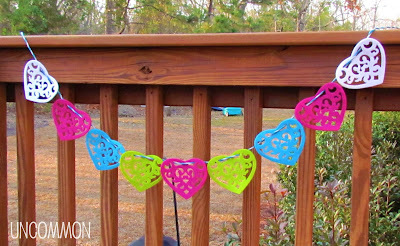 I often keep a lot of x mas decor out and use for Valentines Day..Such a frugal move and super cute banner! I picked up a bunch of the hearts as well for the same reason!! My Target only had white left, the colors are awesome! ugh . . . I too did a little ore Target shopping than planned. I’m always in love with felt ornaments! I stocked up when they were 30 cents. Now I feel like I overpaid! Thanks for some great ideas of what to do with these sweet little hearts. I have to make it through making birthday party favors for a friend and wedding activity books for a friend before I can get to Valentine’s day decorating! Ok, I felt like I was writing the beginning of your post myself. I did the same thing. i totally went nuts when I realized they were 10 cents per 3 pack! I thought of so many great ideas! Hung some blue ones from my chandelier today for an laid back baby shower. Love the garland idea. This also makes me want little ones again. I love the cute little treat bags, those are great. Oh, I love Target too and I that store gets me to buy more stuff with their great buys lol. Ha! I had to bring my husband to Target with me to look for a baby’s first ornament, because I knew I’d buy something crazy like a hundred felt hearts for .10 each. It’s just such a great deal and there’s always something you can do with them! Super cute valentines! Oh, you came up with some great ideas for this deal. Nice. I love them both! That is so something I would do (buying all the hearts). You would be able to use them for so many things! Thanks for linking up to Tell it to Me Tuesday @ Creatively Living! I bought several packs of the white hearts for something…just not sure what yet! 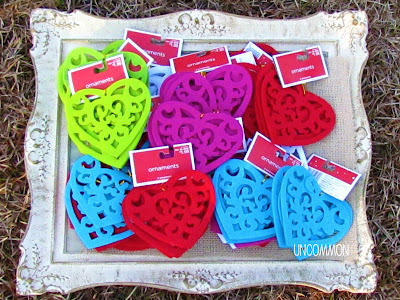 I picked up a handful of those hearts as well, thinking they’d be perfect for Valentine’s Day. My Target was out of red but the other colors are great too. I hopped on over from Serenity Now when I saw those hearts. I picked up a whole lot of those hearts from Target a few weeks ago. 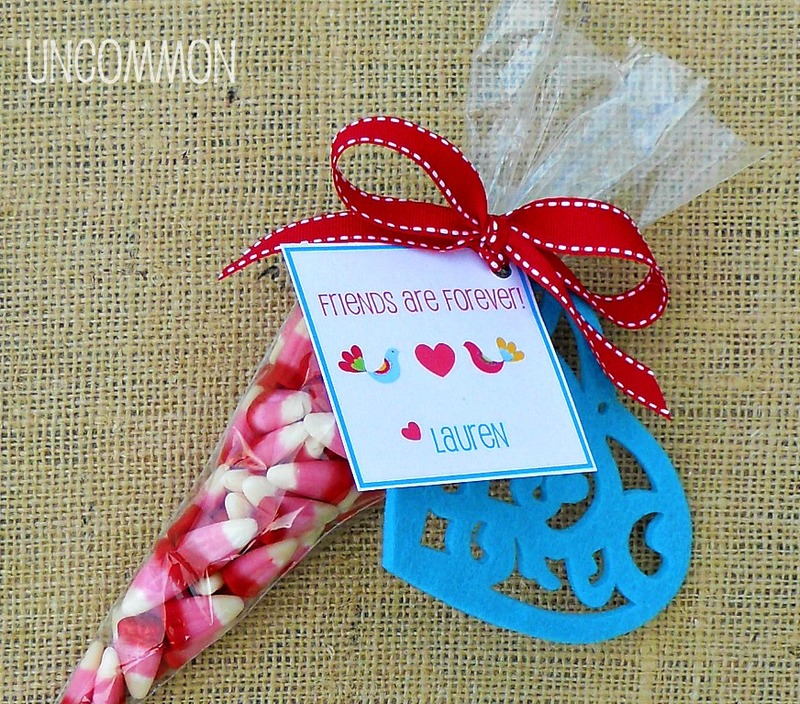 I knew they would be perfect for valentine day projects! I plan on using mine for a mantle banner. Thanks for sharing all your ideas for them. Cheers and Happy Friday! She is going to be pretty popular passing those out on Valentines Day! Fantastic idea – way to think ahead! Visiting from Serenity Now- I love this post. You never know what you will find at Target! So cute!! I got some of the 10 cent goodies but all that I saw was christmas… no vday stuff! Love that clothesline too!! Gotta love Target!! the garland is adorable!! my party blog followers would love to see this.. 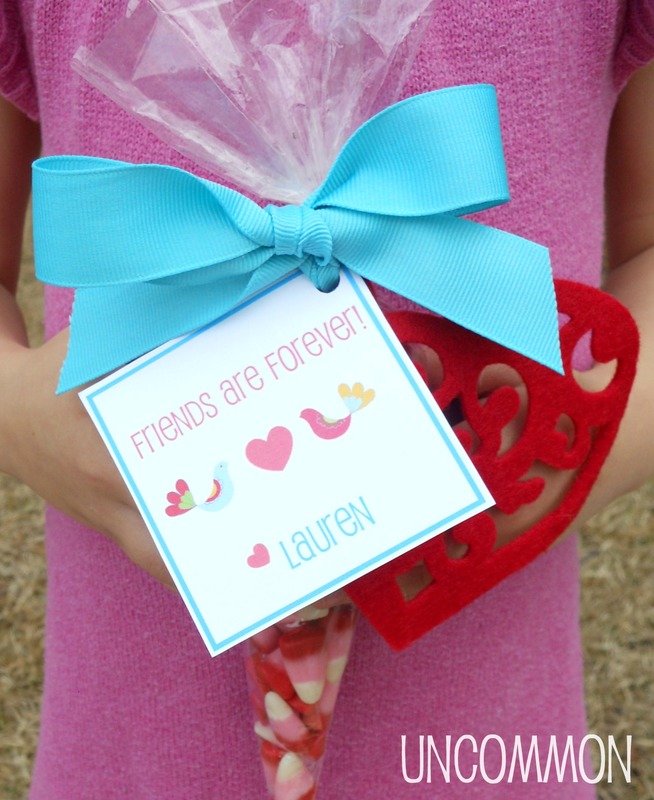 Your little one’s classmates are going to love the Valentines. That’s great that you got such a good deal on the hearts. So cute! I love new crafts to make with my kids, especially for holidays. Thanks for sharing at Craft Envy linky party! I am a Kindergarten Teacher and I also bought these to use in my classroom!!! I new that they would be great for something in February!!! LOVE IT! So, so cute!! All of her friends are going to love those Valentines! And the banner is so adorable, and I love how simple it was to make too 🙂 I’m your newest follower! I’d love for you to stop by my blog and follow me back if you’d like. I have a lot of Valentine’s Day ideas posted lately! I got a bunch of these hearts, too! But there was no RED to be found at my store! Oh,wow! 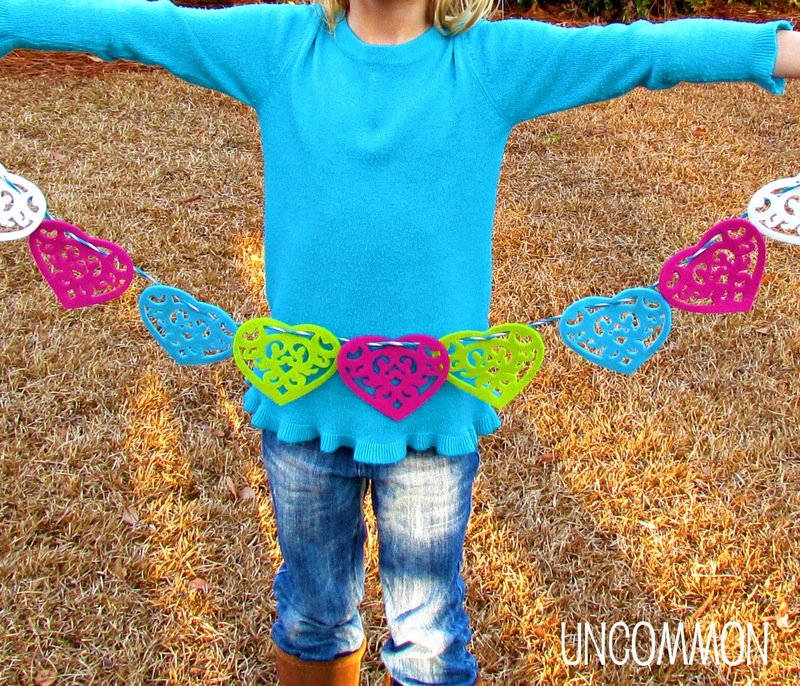 You’re so kind to link up your posts to my Valentine Link Party! Thanks for taking the time to do that! ohmygosh. These are such cute ideas. 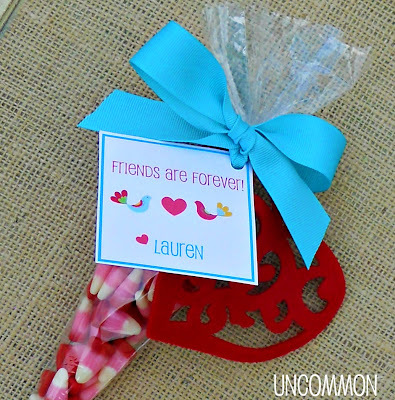 Love the turquoise additions to the traditional valentine’s day colors. I would have done the same thing if I were in Target. You never know where you can use them! Love how you used those hearts. You must be a kindred spirit because I did the same thing! I think I bought at least 30 packages. Figure I shouldn’t run out of hearts for a long time. I am going to make banners out of mine too for some of my girlfriends. So cute! Such creative ideas,it was meant for your to buy so many, because you are so creative to find so many ways to use them. So very cute. Thanks for sharing your inspiration at Sunday’s Best! I love Target clearance! Those little red tags just call my name! I love your banner and your gifts.. they are oh so cute! I featured this on a Valentines roundup And.. thanks for linking up to my Financial Friday Link Party! I hope to see you there this week too! How fun we both fell in love with these hearts! I just posted my banner I made with them. Darling blog! Got to love a good target clearance right? 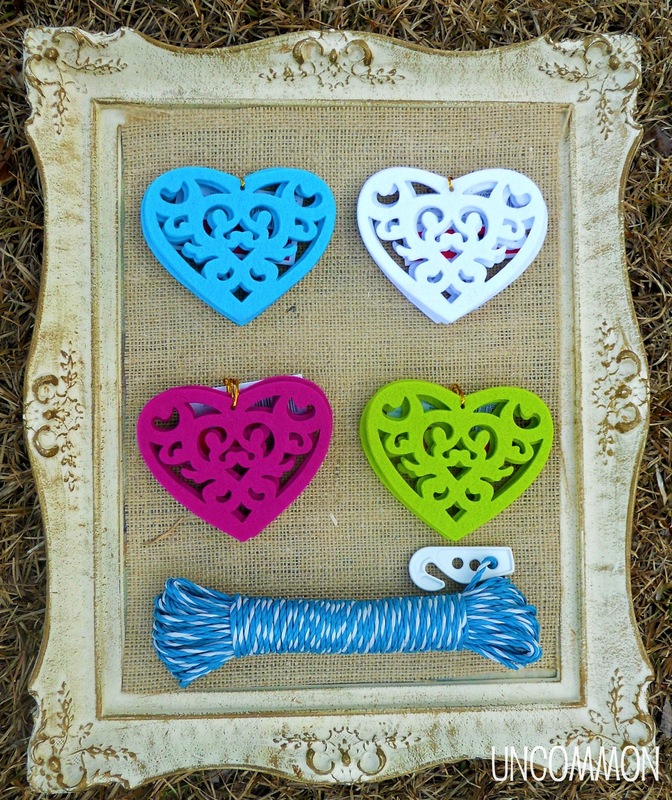 I got the turquoise, pink and white hearts. I made coasters out of them. I glued two colors together and got one coaster. I am looking everywhere for these hearts! If you have leftovers and would like to sell 🙂 please email me. I also bought some for 10 cents a pack and wish I had purchased more!! I did the same thing! I used some for a craft in my daughter’s preschool class. We took two hearts and glued pretty cellophane in the middle. They are cute sun catchers now.